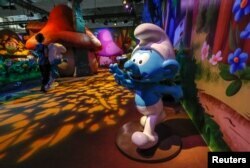 A Smurf characters is seen at the Smurf Experience exhibition, depicting a larger-than-life recreation of the Smurf village, marking the 60th anniversary of the creation of the Smurfs by cartoonist Peyo, in Brussels, Belgium, June 12, 2018. Belgium is celebrating the 60th birthday of the Smurfs by giving fans the chance to experience living in their village and take a virtual reality ride through mystical forests and caves. A boy walks past a Smurf character at the Smurf Experience exhibition, depicting a larger-than-life recreation of the Smurf village, marking the 60th anniversary of the creation of the Smurfs by cartoonist Peyo, in Brussels, Belgium, June 12, 2018. After a great public response and demand for more Smurf adventures, the Belgian put the blue-skinned creatures center stage with their own comic book the following year. Smurf characters are seen at the Smurf Experience exhibition, depicting a larger-than-life recreation of the Smurf village, marking the 60th anniversary of the creation of the Smurfs by cartoonist Peyo, in Brussels, Belgium, June 12, 2018. 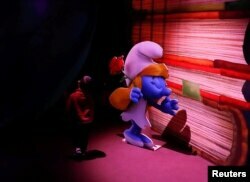 ​In the Smurf Experience at Brussels Expo, which will run until late January 2019, visitors are taken through the Smurf village, with human sized mushroom shaped homes, and the virtual reality ride, while fighting Gargamel. "They (Smurfs) are a symbol of Belgian culture and of Belgian heritage," said Chloé Beaufays, the spokeswoman of the exhibition. Organizers hope to take the exhibition to other European countries as well as the United States and Asia over next five years.